Automatically "turns on" in the dark, and "turns off" in the light. 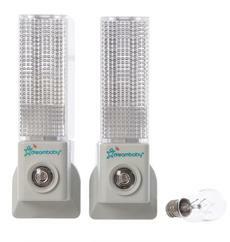 Provides a soft light and is suitable for any room in the house. Fire resistant material. Easy to use. These replacement bulbs are available for easy use of automatic sensory night lights, which turn on when house lights are turned off. This makes it easier to find one's way around in the dark and ensures better safety for your child at home.